Luke Parker finished with a gamehigh 33 disposals, also recording 12 contested possessions, seven tackles, five clearances and two score assists. Co-captain Jarrad McVeigh was also prolific, collecting 28 disposals. After finishing scoreless against former side Hawthorn in Round 8, Lance Franklin has booted 14.2 from his next three games, including 4.0 tonight. North Melbourne has recorded 15 scoring shots to just six in the second half, recording 25 inside 50s to Sydney's 18. It has outscored them by 27 points from turnovers. Andrew Swallow has applied an equal gamehigh 11 tackles, on the back of applying 11 and 13 in his previous two games. Trent Dumont becomes North Melbourne's seventh individual goalscorer for the game. It has has scored 6.1 from set shots compared to 3.9 from general play. Jeremy Laidler's ability to read the play has been outstanding, recording a gamehigh 12 intercept possessions, of which six have been intercept marks, also a game-high tally. Sydney Swans InterchangeHeath Grundy off due to an injury. The Swans have generated 25 points from defensive midfield chains compared to the Kangaroos' six points from that zone. 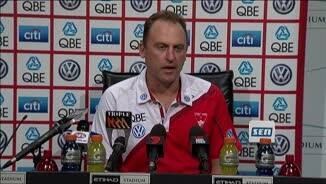 Sydney Swans InterchangeDaniel Robinson was substituted into the game for Gary Rohan. Ben Cunnington (10) and Josh P. Kennedy (11) are the only two players on the ground to record double figure contested possession tallies. North Melbourne hasn't made the most of its opportunities from clearance chains, scoring 1.8 (14) via that source. Sydney has also been wasteful, recording 2.3 (15). North Melbourne InterchangeTrent Dumont was substituted into the game for Scott McMahon. Adam Goodes has hit the target with all 11 disposals. He has booted three goals straight, of which two have been recorded in the third term. He has also been involved in five scoring chains. 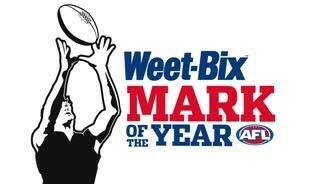 Robin Nahas kicks North Melbourne's third goal for the quarter. He ranked sixth at the club for scoreboard impact heading into tonight's game. The Kangaroos are enjoying greater time in their own forward half in the third term, leading the time in forward half differential by 24 per cent. Jarrad McVeigh has been involved in eight scoring chains, a gamehigh tally. Robin Nahas and Shaun Higgins have five score involvements apiece for North Melbourne. 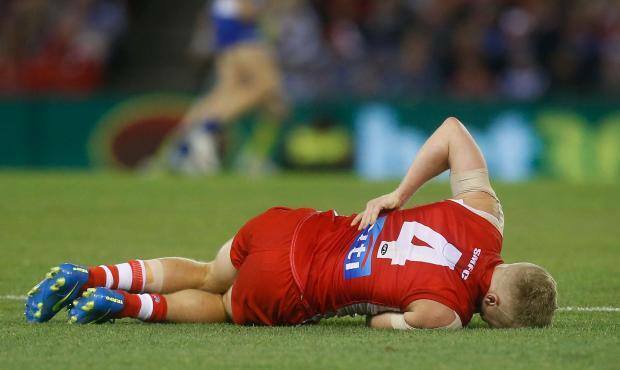 Swans InterchangeDan Hannebery off due to an injury. Kangaroos InterchangeDrew Petrie off due to an injury. Kangaroos InterchangeLindsay Thomas off due to an injury. Welcome to Etihad Stadium for the North Melbourne v Sydney Swans Round 11 clash. THE SYDNEY Swans have withstood a fierce second-half challenge from North Melbourne and cemented their top-two spot following a 16-point triumph at Etihad Stadium on Saturday night. 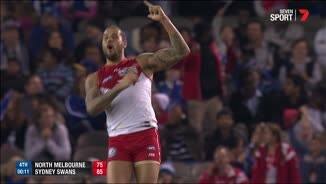 Lance Franklin's four majors and a vintage performance from a rejuvenated Adam Goodes propelled the Swans to a 14.7 (91) to 10.15 (75) victory, and back above West Coast on the ladder with a 9-2 win-loss record. 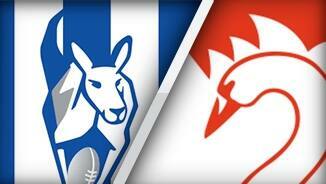 Despite the Roos' endeavour, their season is back on a knife-edge at 5-6 following their third loss in four games. Goodes bagged three majors from 14 touches, shrugging off the booing of Roos supporters – who ignored Jack Ziebell's appeals to respect the dual Brownlow medallist - to wield a significant impact on the match. Franklin flitted in and out of the game, but had the better of Scott Thompson, and in typical style stood up to kick the match-sealer in the final minute with a wobbly 55m bomb. Lewis Jetta (20 possessions, one goal) and co-captain Jarrad McVeigh (28) were the architects from half-back, while star midfielders Luke Parker (33), Josh Kennedy (27) and Dan Hannebery (22) were influential. Todd Goldstein (17 disposals, 37 hit-outs) continued his stellar season in the ruck, but the Roos never hit the front despite onballers Ben Cunnington (23, 10 clearances), Andrew Swallow (19) and Jack Ziebell (19) helping to win clearances 43-27. The Swans built the hard-fought win on a dominant second term, when they booted five goals to one, opening a 29-point advantage at half-time. North rallied after the long break and interim coach Darren Crocker's men threatened to steal a huge upset when they finished with all the run after trailing by 20 points at the final change. The Swans wobbled under pressure, but from six scoring shots the Roos only managed 2.4 to 2.0 and the visitors held on. "It was a pretty strong display that first half of football and they were always going to come and had their turn in the second half, but we were able to kick some important goals at important times and held them at bay," Swans coach John Longmire said post-match. 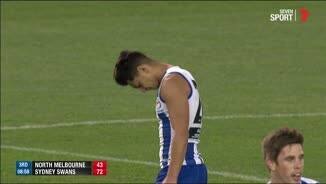 The Roos were left lamenting a crucial missed set shot from 30m by Jarrad Waite at the 21-minute mark, which would have brought them back within a kick. When the impressive Shaun Higgins (17 disposals, two goals) dragged his 50m set shot wide with a minute to go the game was just about up. 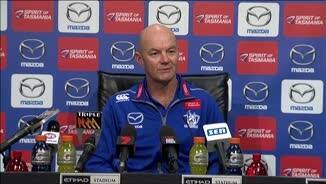 Crocker said the Roos "more than matched" the Swans, except for the frustrating second quarter. "Turnovers just killed us, their first six goals of the game came from our turnovers, giving the ball back to them," he said. "You always know with Sydney they're going to come after you and their pressure's going to be pretty high. "But you've got to be able to absorb that pressure and for the most part we did, but just for that period of time we just coughed the ball up too much." The Swans have now registered six-straight wins, and Longmire's men will rest easy over the bye knowing their shot at redemption from a dismal 2014 Grand Final is well on track. The 12th-placed Roos – who have lost nine of the last 11 against the Swans - are stuck in a dog fight just to play finals after again falling short against one of the League's elite teams, having also lost to Hawthorn and Fremantle this season. They face a critical clash with Greater Western Sydney at Spotless Stadium next Saturday before the bye.